For acoustic protection across the lower spectrum of sound waves, you need bass traps. Traditionally, acoustic foam bass traps come in grey. Whilst we love to keep it traditional every so often, sometimes the occasion just calls for something a little more colourful. 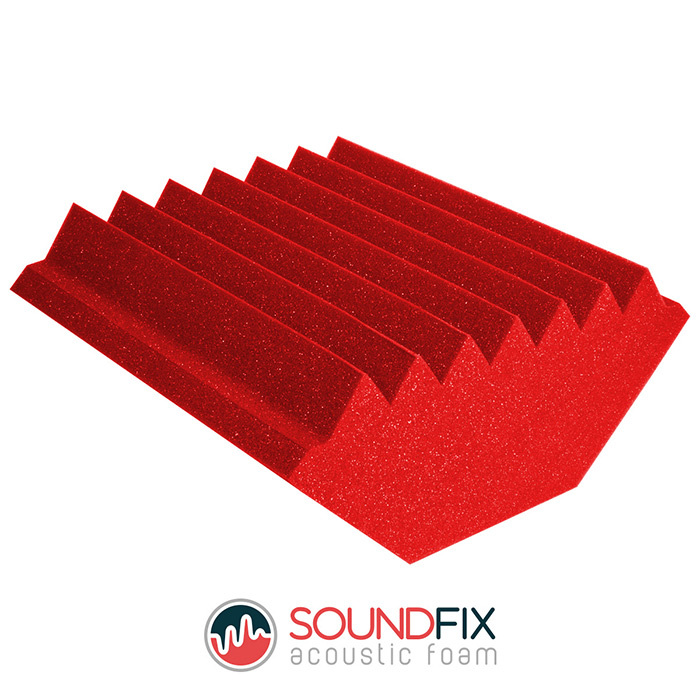 Our Red Acoustic Foam Bass Traps provide just that; the same superior sound absorption, with a little more vibrancy! Red Acoustic Foam Bass Traps. Manufactured within our UK based factory. Protects against indirect sound waves in the lower spectrum. NRC rated 0.85! Absorbs up to 85% of sound wave energy. Can be used in recording studios, home cinemas, public buildings, restaurants, concert halls and much more. 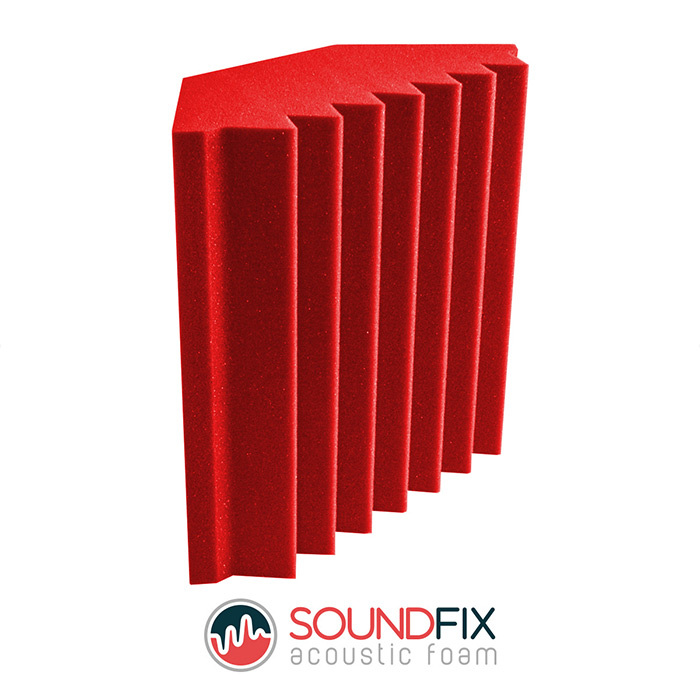 Red Acoustic Foam Bass Traps are used for acoustic treatment and should not solely be used with soundproofing in mind. Acoustic foam works as a sound absorber. When sound waves travel into the cells of acoustic foam, they lose energy. This helps to prevent sound waves from reflecting and creating indirect sound waves. When a room is properly acoustically treated, most sound which is heard comes from direct soundwaves. This results in greater clarity and quality of perceived sound. Not all sound waves are the same, some contain more energy than others. Low frequencies (bass) require thicker pieces of acoustic foam to reduce the energy they contain. Our Red Acoustic Foam Bass Traps are designed to fit comfortably into room corners where bass most frequently travels towards. Red Acoustic Foam Bass Traps don’t just have to be used within recording studios. Our customers find use for them in a wide variety of room types. From home cinemas to event halls and public buildings, wherever there’s a need for acoustic treatment our Red Acoustic Foam Bass Traps can help! They’re simple to install as well! All you need a spray adhesive (not included) and a room to mount them in. Install alongside our acoustic foam tiles and corner cubes and notice the immediate effect it has on the quality of sound. Why Choose These Red Acoustic Foam Bass Traps? Not only does this product look fantastic, it’s also manufactured to the highest calibre using only the best materials. We manufacture everything to ISO 9001 standards and all our acoustic foam is UL94 approved; exceeding UK Fire Safety Regulations. What’s more, our acoustic foam also has an NRC rating of 0.85. This means that it can absorb up to 85% of sound wave energy. That’s on average 25% more effective than the industry standard of 60%. If you’re looking for acoustic foam with a little extra wow factor, these bass traps are ideal for you. When you purchase from us, you’re buying straight from the manufacturer. Not only does this save you money, you’re also able to take full advantage of our wealth of knowledge thanks to being in the foam industry for more than 40 years! If you need to know more about our Red Acoustic Foam Bass Traps or another product, just ask! Have these on back wall from ceiling to floor and they've made a big difference. Bought on the Tuesday turned up on the Wednesday. Didn't know these came in red. Really glad they do though. Very nice bass traps love the red! Look great along with the tiles. I bought these and some grey tiles think they look pretty cool. These look fierce. Great traps at a great price. A nice little set of bass traps, great colour and quality. Good quality bass traps. Also have the tiles which are also very good, just can't be bothered to write 2 reviews. Great quality and not a bad price. Got me a nice little acoustic foam set up now in my favourite colour. Mixed these with blue tiles. Along with the white walls it's looking very patriotic lol. A very nice colour looks better than the grey ones. Well made already recommended the acoustic foam to a friend. I bought these with some red tiles as I couldn't find a set together. Happy with them, but not had much chance to try out properly yet. great colour, great bass traps. Great job GB foam, the bass traps work fantastically. looks awesome, sounds amazing, what more could I ask for. Looks great, Sounds excellent, need I say anymore? Good bass traps, worth what I paid. These go nicely with the grey tiles I bought. Bought a couple to test and pleased with them, planning to buy some more next month. Love these bass traps. Well made and turned up in time. I alternated between grey and red. They look great and my son was over the moon with his new setup. Decent bass traps. I really like the colour. Bought with the red acoustic foam tiles, haven't put them up yet will hopefully get around to it soon. So far so good though. Bought with grey tiles to add a couple of focus points around my studio, looks pretty good! Love the red. Would buy again. Great colour used with the grey tiles to mix things up a little bit. I like the results. Fantastic looks amazing with the red tiles and corner cubes. Great bass traps and I love the colour! They really stand out in my studio.